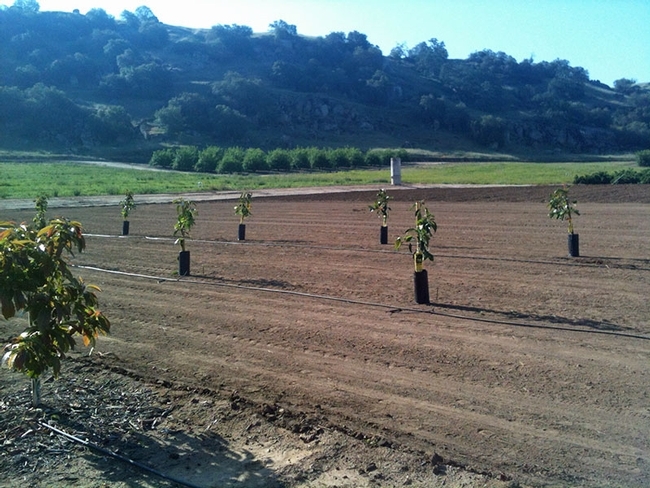 Planting avocados in research plots at the UC Lindcove Research and Extension Center. The San Joaquin Valley is the heart of California agriculture, but hasn't been a hospitable home for commercial avocado production. UC Cooperative Extension specialist Mary Lu Arpaia is conducting research to change that. Avocados are native of semi subtropical high elevation rainforests in Mexico and Central America. A delicious and highly nutritious fruit, the cultivation of avocado has spread around the world. In California, growers are having commercial success in areas with year-round mild climates, such as San Diego and Ventura counties. Though avocados are frost sensitive to be sure, it is not the cold winter climate that is the greatest impediment to avocado production in the state's inland valleys. It's the heat. The stomata on the leaves of Hass avocados – the variety most favored by California consumers – close when the temperature rises above 90 degrees. No moisture is released from the closed stomata and the plant overheats, causing fruit drop. 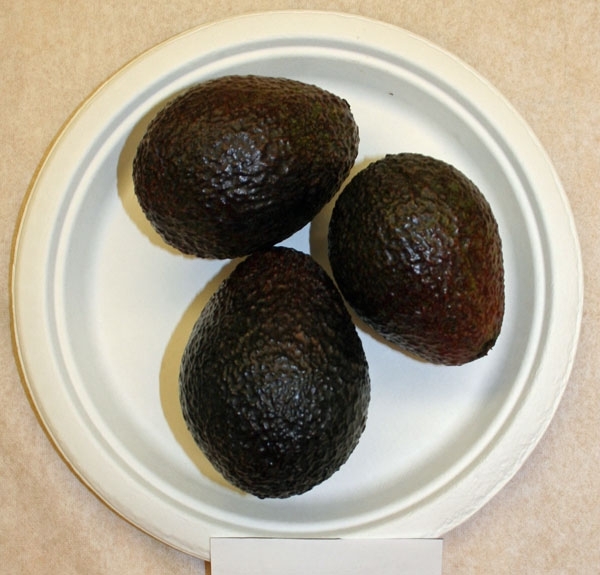 “To grow avocados in the valley, we need to have a variety that can tolerate heat better than Hass,” Arpaia said. An avocado variety currently named 465202-99 was planted in 2013 and already has a substantial crop for 2015. It looks nice and has performed well in taste panels. Over the past four years, Arpaia has planted avocado varieties selected by UC Riverside at the UC Lindcove Research and Extension Center near Exeter. Twelve different varieties are now growing in the plot. The UC Riverside selections have undergone rigorous testing for yield, the length of time ripe fruit can remain on the tree, and eating quality. “The ones that we're testing in the field have eating quality comparable to Hass,” Arpaia said. Lindcove is situated where the valley floor is gently rising toward the Sierra Nevada. The slope allows cold air to slip down to lower elevations, giving farmers in the area an advantage of a few degrees in the winter. The geography has made the area an important location for citrus production. But heat-tolerant avocados could be an alternative. East-side citrus farmers may be looking for other options if Huanglongbing (HLB) disease makes its way to the area. Already, the pest that spreads HLB, Asian citrus psyllid, is established in some parts of the valley and spreading. Once a tree is infected with HLB, it cannot be cured. An initiative to enhance competitive and sustainable food systems is part of the UC Division of Agriculture and Natural Resources Strategic Vision 2025.